These luscious Lemon Cupcakes are perfect for any time of year, but especially during the Spring with the cute free printable Spring Cupcake Toppers! There is something about lemon dessert that is refreshing to me. I’m a big fan of pretty much any flavor, but the Spring flavors – lemon, lime, strawberry – those are my favorites. 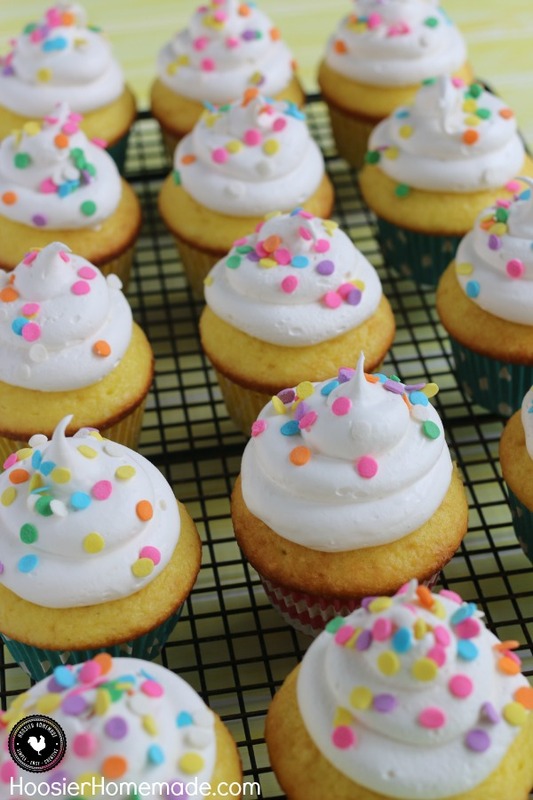 And these Lemon Cupcakes – they are heavenly! Earlier this week, we took dinner to church to the praise team. The service that we attend is a bit more contemporary and has a full band with singers. We enjoy the music so much, that we wanted to give back to them for all they do. So we prepared dinner, Lasagna, Salad, Garlic Bread and these Lemon Cupcakes. It just so happened that two of the members were celebrating birthdays this week, so cupcakes worked out perfectly. The cupcakes start with a box mix – you know I like to keep it simple. Then for an extra burst of flavor and to add even more moistness, a small box of instant Lemon pudding. Then I added my normal extra ingredients that I add to make a box mix taste homemade – buttermilk, eggs and oil. The Marshmallow Frosting is one of my favorites and went perfectly with the lemon flavor. And even better, it has only 2 ingredients – whipped topping and marshmallow fluff. It’s the same frosting I add to brownies. It’s light and fluffy and super easy to make. To decorate the cupcakes, I fitted a decorator bag with a #1A decorator tip (my favorite) and swirled the frosting on. Then of course, I just had to add sprinkles. 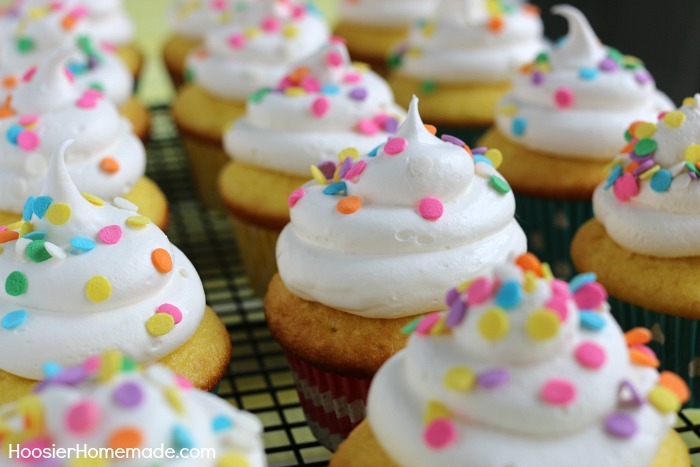 The Lemon Cupcakes with Marshmallow Frosting were perfect to hold our newest addition to our printables. 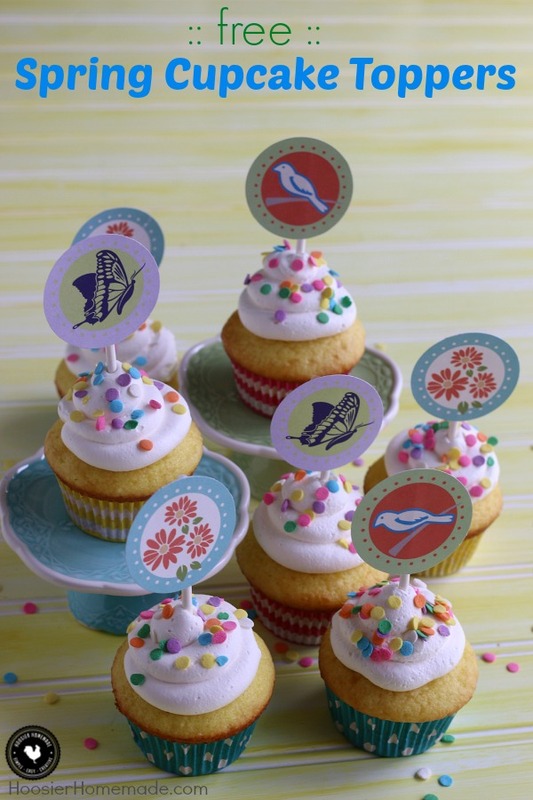 The Spring Cupcake Toppers are available for FREE to all Cupcake Chronicles Newsletter subscribers. Not a subscriber? You can read all about the newsletter and sign up! It’s FREE too! Depending on the amount of frosting you add, you may need to double the recipe. If you want a large amount, like I added, you will need a double batch.